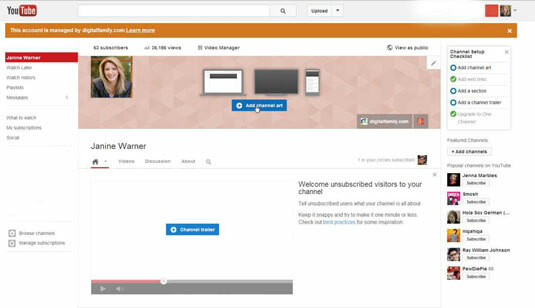 With your new YouTube channel art created, it’s time to upload it to YouTube. You may need to resize it and move it around the interface a bit for it to achieve the effect you’re looking for. If you can’t fit the “safe” area into the horizontal stripe in the profile banner template, don’t panic. Just backtrack to the image-editing program and make changes to your image based on the problems you see after you upload it to YouTube. 1Log in to your Google account. Click the down arrow next to your profile in the upper-right corner. 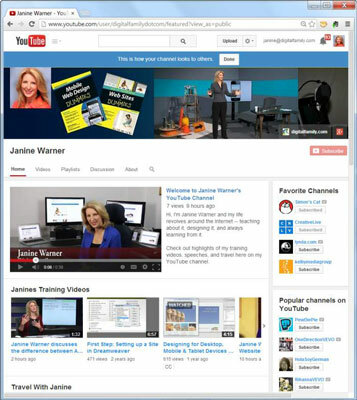 The drop-down menu with options to control your YouTube profile appears. Your channel administration page opens. If you haven’t already uploaded a banner image, the central graphic on the page will prompt you to do so. Note: If you’ve uploaded a banner image, roll your cursor over the cover image, and a drop-down menu appears from which you can select Edit Channel Art to replace the image. 3Upload an image to select a photo by dragging an image into the upload area or by clicking the blue Select a Photo button in the middle of the Channel Art screen. The Channel Art window appears, with graphics showing you how your image will look when displayed on different devices. As you can see, YouTube’s responsive design makes the narrow banner fit on all manner of displays. However, the maximum size on the TV setting leaves a huge amount of space above and below the strip that is visible. 4Click the Adjust the Crop button. A nested rectangle appears. Drag the crop handles to shrink or expand the photo to fit the size, or drag the image so that the most important part fits into the horizontal stripe that is featured on desktop and mobile sites. 5Click the Select button when the image looks the way you want it to. Your new banner appears on your YouTube channel. Test to see how well you centered the crucial content in your design by clicking and dragging the browser window to resize it. You should see the pixels on the sides of your cover art image gradually get clipped off and reappear as you drag the window back and forth. If you really want to test things, try accessing your YouTube page on a smartphone, a tablet, or even on a device enhanced with Google TV to get the full effect.